I love to flip through cookbooks, but lately I’ve been more interested in food theory — books about ingredients, techniques, flavors, etc. Besides not being able to stick to a recipe to save my life, I prefer to learn the concepts behind cooking. It’s like that saying: Give a gal a fish recipe and she’ll eat for a night. Teach her how to cook it and she’ll eat for a lifetime. Or something. I found an incredibly interesting book in the university library called The Flavor Principle Cookbook. 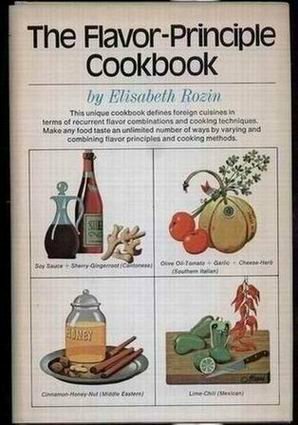 It discusses the flavor principles and cooking techniques of several cultures, and then offers examples of traditional dishes and unique ways of combining ideas from different regions. This seems progressive for 1973. You can almost draw a map and follow the cuisine. These are still very basic formulas, but they get you to start thinking. After reading this book it was so easy for me to explain to my friend Annabelle why she enjoyed Indian food so much. Annabelle’s parents are Venezuelan and she grew up in Los Angeles. Naturally, she grew up eating Latin food. She hadn’t tried Indian until last month, but she loved it. Well if we consider the flavor principles of both cultures, we find a lot in common. Tomato, garlic, cumin, coriander/cilantro and hot peppers are all basic components of many Indian and Latin dishes. The Flavor-Principle Cookbook is out of print, but if you can find it, I highly recommend it. I learned a lot, and we had a lot of success with her bulgar-stuffed chicken with a honey-sesame glaze. I’ve always found it odd how many things now considered “progressive”, like organic farming and subtle changes in regional cuisines, are really the long-term traditions of a place that have only recently been besieged and then rediscovered. It wasn’t that long ago that similar culinary patterns could have been discerned in the US; there used to be significant differences between local cuisines throughout Appalachia and the Ozarks, for example, despite being broadly similar. This sounds like an interesting book. Reminds of a new book called the Flavor Bible by Karen Page and Andreww Dornenburg. It seems both books are built on a similar concept. One of the main Thai flavor combos would definitely be Fish sauce + Palm Sugar + Tamarind. Leela — We love the Flavor Bible. Michael bought it a few months ago, and I think it’s the best book ever. I experiment in the kitchen a lot, and it comes in really handy. It’s also really fun for coming up with unique ice cream flavor ideas.